Journey to New Hampshire Homestead: Day Off from Work Does Not Mean Day Off from Working! Day Off from Work Does Not Mean Day Off from Working! Steve had the day off today for Presidents' Day. it was a good opportunity to get some things done around here. It is bright and sunny today, which almost always means cold. Was minus 12 first thing, and has warmed up to 16 degrees. Actually, if you are working, and are dressed right, it isnt too bad. New Englanders have a saying, "there's no bad weather, just bad clothing". Steve worked at shoveling the snow off portions of the roof. Can you see how deep it is up there? Why shovel, you ask? 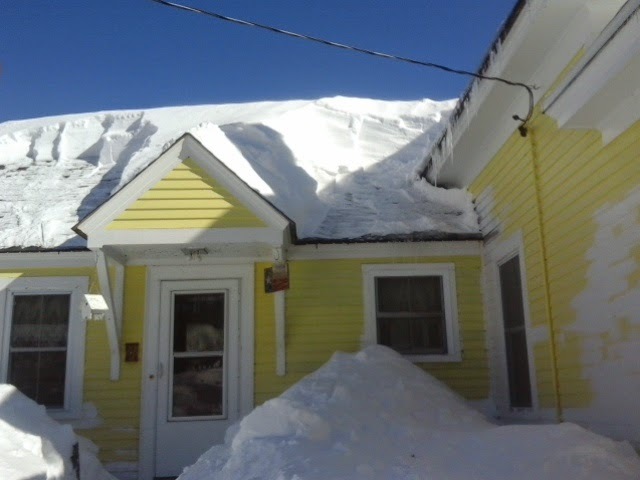 Snow is heavy, alot heavier than you might realize, and can cause roofs to collapse. There have been numerous incidents of roofs caving in around the region lately. 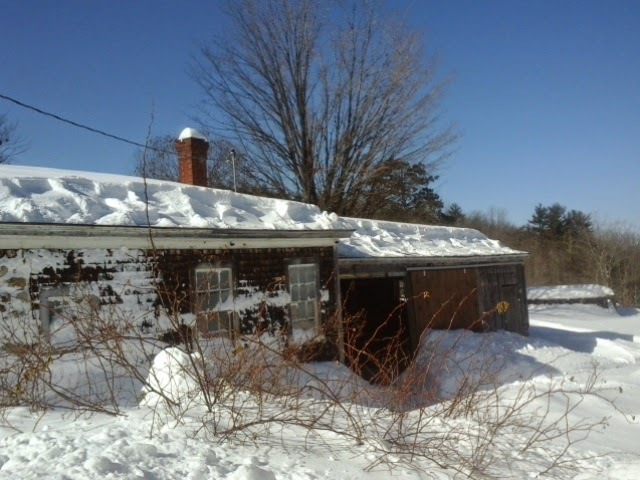 Shallow pitched roofs are especially vulnerable to heavy snow loads. 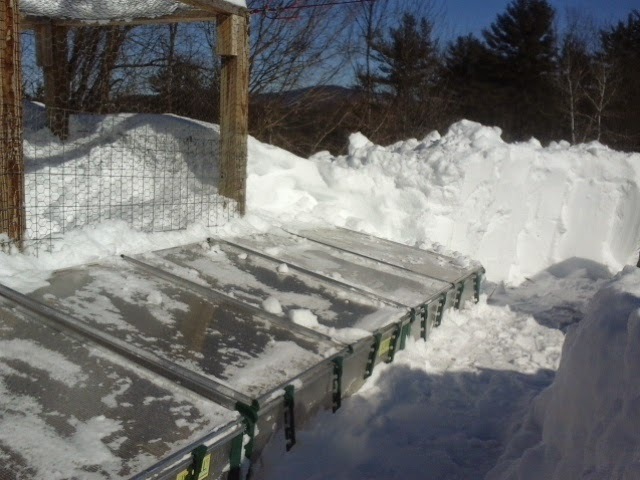 steve did the whole back side too, but I did not want to slog through thigh deep snow to get a picture. 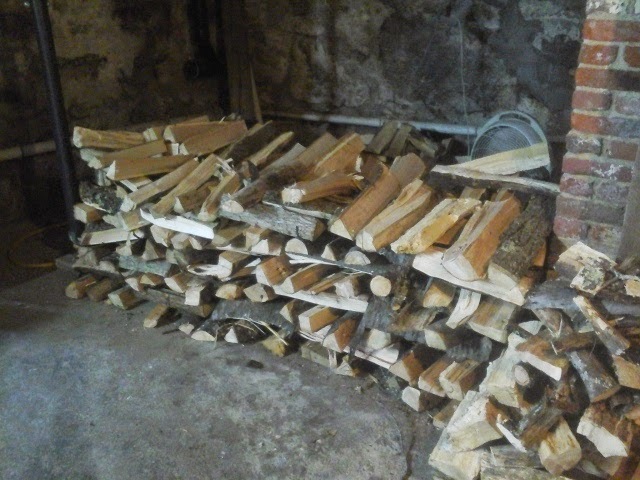 He also split another stack of firewood, and we moved it to the cellar to help it dry out some more by running a fan on it. Thats why it is stacked so loosely. There is another old yankee saying about cordwood. A cord is defined as a stack of wood 4 feet high by 4 feet wide, by 8 feet long, and it should be stacked "with enough room between logs that a squirrel can hide, but not so far apart that a cat chasing the squirrel could follow." By that definition, this pile is too loosely stacked. 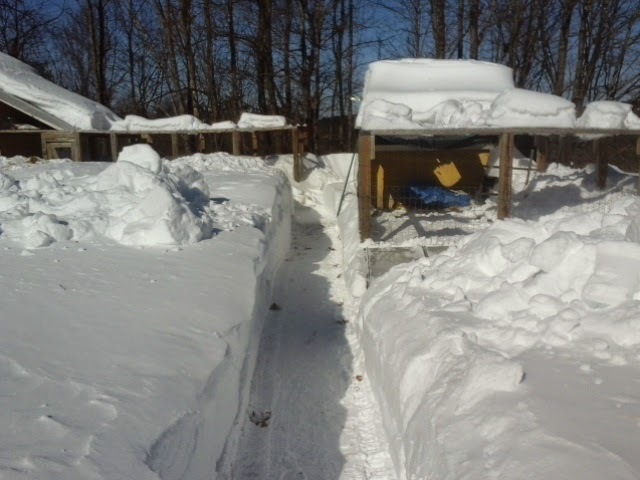 HE also snowblowed the path down to the two pens. the snow is past waist high on me now. I dug out the cold frames. They were buried with at least three feet of snow on top. You can see the depth of the snow behind them. My hope is that getting the sun on them will start the soil thawing inside, and I might be able to start a few early garden seeds. 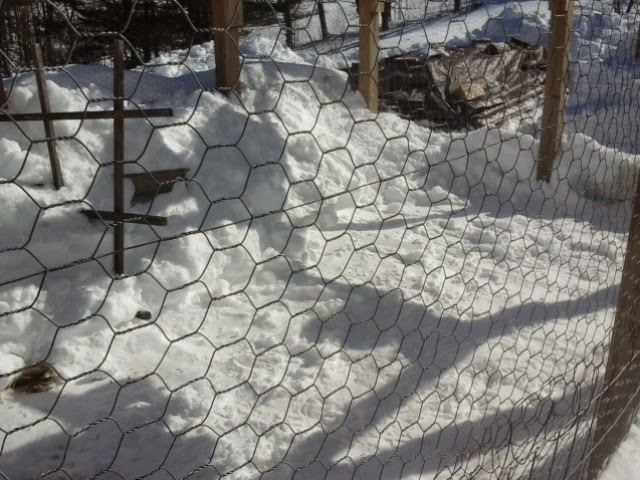 I also dug out the duck pen, which is our temporary dog quarters. There is still quite a bit of snow, but at least they have an area where it is packed down. The biggest task was digging out the wood pile. It was completely buried and not visible. Wish I had gotten a "before "picture. This is all scrap lumber gleaned from taking apart the old raised beds in the garden. I plan to cut it up and use it for burning when we boil the sap. So it was important to try to get it cleared and have access to get to It. Sugar season will start soon. I might move some of the wood inside the shed. Another view. 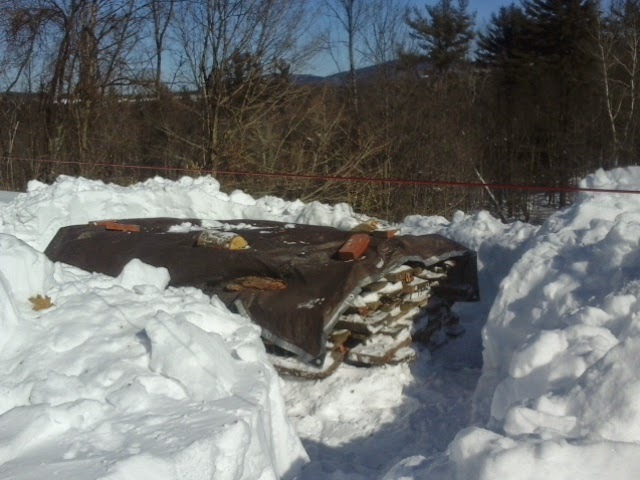 I was thankfully able to get the tarp unfrozen, and shake it off and put it back on the pile. 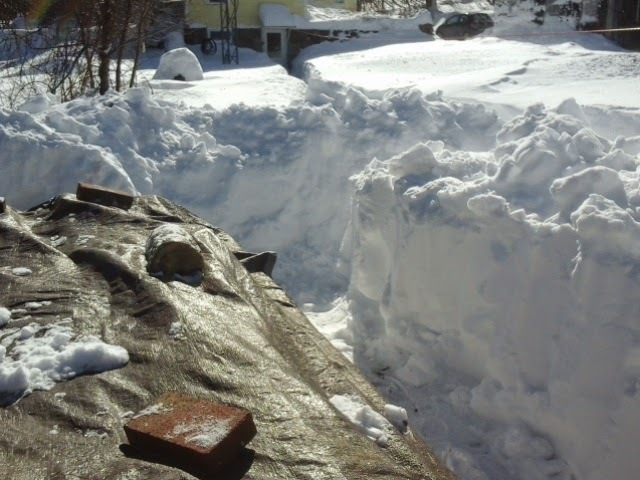 It also had at least three feet of snow on top. So we just stopped for some lunch of leftovers, and steve is headed out to work on some more splitting. The chickens were enjoying the sunshine, taking the chance to "sunbathe" where the sun was streaming in their coop ... I would have taken a photo, but its really cold out there, so you willl have to take my word for it.